If your old and valuable Persian rugs need advanced cleaning and professional repairs, Prosco can recommend the best people for the job. Persia, or modern-day Iran, is the irrefutable world leader of the carpet manufacturing trade. The ancient and unique art of weaving and dyeing carpets has been handed down from generation to generation here. And it continues to be one of the most valuable manufacturing processes used by carpet manufacturers today. Thousands of different rug styles, models, and sizes are being hand-woven periodically, and they reach the homes of people in all corners of the world. Generally, the carpets manufactured in Iran receive the names of the areas they are made in. Some of the most popular Per sian carpets are Hamadan, Shiraz, or Mashad, to name just a few. If you have already been introduced to one of these masterpieces, and you almost feel it is a sacrilege to walk on your Persian rug every day, you are probably interested to learn what you can do to provide it with the best care and treatment. Whether you are currently looking for cleaning services or you need some help with your damaged carpet, Prosco can recommend the best technicians in your area. No matter which of the above services you might be looking for, Prosco can introduce you to the most reliable and skilled oriental carpet and Persian rug technicians in your town or zip code. These experts know the exact intrinsic value of each of these carpets, as well as the impressively rich history behind them. Often times, a weaver will spend a few months up to several months to finish a Persian rug that will reach the stores. It all depends on the size of the rug and the materials used for the manufacturing process. These carpet artists will create thousands of knots, expressing their views and moods, just like painters. Once an area rug is completed, the weaver will proceed to cut it from the loom, wash it, and let it sit in direct sunlight to dry. You can opt for Persian rugs made of wool, silk, and other fin materials. Just keep in mind most of the silky carpets are known not to handle stress too well; thus, the reason why you will oftentimes see them on display on walls rather than actual floors. A well-experienced carpet technician should know all the ins and outs of the weaving and dying, as well as the Persian rug cleaning secrets, dos and don'ts that will make all the difference. Get in touch with Prosco and have them direct you toward the nearest, fastest, most affordable, and most reliable cleaners and repair services for carpets. All Persian rugs need to be treated like a unique piece of carpeting with its own characteristics that require custom care. Each individual carpet features its own origins, age, dye color and type, weaving methods, and fiber content. It is, therefore, impossible to rely on the same unique cleaning solution for each carpet. A professional cleaner will take his time to carefully assess each rug and create an action plan revolving around these factors. The cleaning procedures are initiated with a thorough assessment of the carpet. The purpose of the inspection is to determine if there are any spots or stains covering the rug. Signs of wear and tear are also kept an eye on. For this, the cleaner will first remove all traces of dirt, dust, and crumbs covering the rug. Then they will rely on their expertise to decide whether the rig needs to receive moth treatment. It is also a procedure that should further protect the carpet against additional moth damage in the future. The next step is a gentle wash cycle with the use of a carpet shampoo that will not harm the fibers. Not all shampoos and cleaning solutions can be safely used on Persian rugs and their delicate fibers. Most contain damaging sulfates and detergents that can affect the integrity of the carpets, their colors dyes and fiber structure. This is why it is crucial to have our rugs professionally cleaned by expert services instead of risking damaging them on your own. Once the washing procedure is completed, the technicians will then move forward to the rinsing and combing techniques for the fringes. The carpet will then be air dried so that the dyes can be accurately conserved. This should also prolong the life of your beloved and fairly expensive carpets. 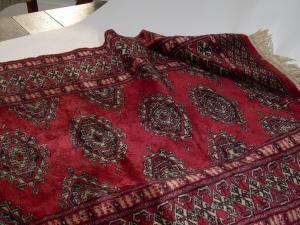 Finally, lanolin oil can be used to soften the Persian rug once the drying is completed. This special oil is known for its remarkable properties that maintain fibers from drying out and tearing apart. Oriental carpet repair services usually encompass reweaving or redyeing procedures. There are times when a repair is not worth the cost, as alternatives can be used. A reliable carpet cleaner should inform you about all of your options and make the best recommendations following your particular needs and budget size. Persian rugs are woven together using blades, looms, and knives and the effort of putting them together is a genuine work of art. They need to last for many generations to come; unfortunately, some factors such as furniture, direct sunlight exposure, pets, and improper maintenance can all lead to holes, broken fringes, or washed-out colors. Rug repairmen can accurately match the original colors and materials of your Persian rug and obtain similar colors and textures for the reweaving. Their work will blend seamlessly with the initial aspect of the carpet. Get in touch with Prosco today, schedule an appointment with the trustworthy carpet cleaners we recommend and bring your rugs to life!